When discussing angling ethics, more often than not, the discussion focuses on littering, snagging, and trespassing. For most of us, these three concerns are enough. However, angling ethics involves much more than the fore mentioned areas suggest. Historically speaking, we, as anglers, have been "looking through the eyeglass in reverse." This practice has lead to an increase in posted land along tributary streams and heated debates among in-state and out-of-state anglers. The time has come to expand the horizon and begin to acknowledge some of the other angling practices that may be construed as being unethical, if not downright unlawful. Angling ethics is not a problem belonging to someone else; it is a problem belonging to us all. In March of 1999, the National Marine Fisheries Service adopted a formal "Code of Angling Ethics." This code was a result of a joint effort between various organizations such as The American Sport Fishing Association, Coastal Conservation Association, Recreational Fishing Alliance, and Trout Unlimited. What follows are the major tenants of the code including a follow-up explanation of each one, focusing directly on Steelhead fishing. However, it is important to note that angling ethics really applies to fishing in general. As with any ethical discussion in any type of domain, there will be some detractors who may find such ideas or thoughts to be contrary to their own personal ethical/moral belief system. However, one should keep in mind that it might be best to forego one's personal interests for the sake of the many. After all, what is done by an individual today, will significantly impact others tomorrow. Promotes, through education and practice, ethical behavior in the use of aquatic resources. The above statement is without a doubt the foundation for this entire discourse on angling ethics. Individuals are not born with the innate ability to practice proper angling ethics; it must be taught to them by a person who has this knowledge and who is willing to pass this knowledge on to them. It is often too easy to complain or voice concern about the unethical behaviors of others. For some, it protects them from responsibility. However, as anglers, we all share the burden of educating those that do not know. We must practice what we are preaching so that others have the opportunity to follow our lead. Values and respects the aquatic environment and all living things in it. For many, respecting the aquatic environment and the living things in it simply boils down to deciding whether or not one will keep (kill) or release a fish. This is a rather short-sighted and narrow-minded point of view, for it means much more than that. While I concede that the decision to keep or not to keep a fish or other aquatic life is important, respect for them begins with the techniques we use to capture these living things. There is nothing more frustrating than standing on a creek bank or standing in waist deep water throwing flies or eggs to uninterested fish. This is particularly true when the water has no flow and the fish simply watch your presentation sit there for countless hours. Frustration eventually sits in. To stir the action, anglers will throw rocks into the water, or will walk through the middle of the stream to move fish in a desired direction. This is both illegal and unethical and should never be practiced. If an angler encounters uninterested fish, the right decision would be to move on to another location to find more active water and fish. Perhaps the angler can move back to those spooked fish to find them more willing to strike his/her bait later. Under no circumstances should an angler herd fish and disturb other anglers. Such an action could result in fines and perhaps an ugly encounter on the stream. Another common practice among anglers is the art of "lining." This technique is also known as "force feeding." Simply put, an angler will search out fish and direct the line or bait into their mouths as they naturally open and close them. Once the bait has entered the fish's mouth, the angler jerks his/her rod as to set the hook. While many will claim this as a "legitimate" practice, it is both unethical and, in the Commonwealth of Pennsylvania, illegal. The largest problem with lining, insofar as legality is concerned, is how the fish takes the bait. According to the "rule of law," a fish must actively take the offered bait. Meaning, the fish will strike the bait/fly out of hunger or anger. This is the proper form of fishing. "Lining" fish goes against this principle. In essence, one's intent is at issue. Consider the following: As you are casually walking down the street for an early evening walk, you begin to yawn because you are tired from a long day. As you are yawning, a bee flies into your gaping mouth. To an unknowing individual, it appeared as though you intentionally tried to consume that insect. Although you did not intend on eating that bee, you were forced to do so because the timing of the flight in relation to your yawn was perfect. No individual in their right frame of mind would intentionally consume the bee. Unfortunately though, many times outdoor enthusiasts inadvertently consume things from the air they wish they had not. To bring this discourse back to the issue at hand, there are times in which fish simply do not strike or are otherwise not hungry for what an angler might be swinging or drifting their way. Most anglers spend countless frustrating hours trying to get a nice pod of fish to strike to no avail. Frustration sets in and some may "force" the issue. It is best not to do this. Many experts will advise anglers to move on to another fishing area and leave the fish alone. As is often the case, leaving the disinterested fish alone for awhile may lead to many hook-ups later on when the angler decides to try for them again. Avoids spilling and never dumps any pollutants, such as gasoline and oil, into the aquatic environment. There is no real mystery to this statement. By and large this is not a real concern along the Lake Erie tributaries. Keep in mind though, that gasoline and oil spills are a real threat to Steelhead. Consider the fact that a couple of years ago there was a fuel spill that nearly affected Twenty-mile Creek. An unattended tractor-trailer was being fueled when the product overflowed the tank, entered a collection drain, and traveled down-slope before being contained prior to entering the primary stream. While a significant fish kill was avoided, the danger is still lurking. Anglers are encouraged to look for signs in the water that may indicate an intrusion of a foreign substance and report it immediately! For personal health and safety reasons, do not try to determine the nature of the substance. Disposes of all trash, including worn lines, leaders, and hooks, in appropriate containers, and helps to keep fishing sites litter-free. Arguably, one of the biggest reasons why stream access is becoming more difficult is because of the litter that anglers leave behind. Private landowners are generally tired of picking up trash left behind by anglers (of course this is a problem at popular Pennsylvania Fish & Boat Commission (PF&BC) properties as well). During the off season, many of these landowners have children or pets that roam the streams. Children and animals getting entangled in fishing line, styrofoam cups dotting the banks, plastic bags blowing in the wind, are all issues that can be easily avoided by taking a trash bag along when angling. The common phrase, "take out more than you brought in," is salient here. Remember, most anglers are very astute of what others around them are doing. If they see others picking up trash, they may be inspired to do the same. Simply having two Pennsylvania Steelhead Association (PSA) sponsored stream clean-ups is not enough. Finally, be mindful that cigarette butts tossed into the stream is considered litter. Take along a plastic bag to discard your cigarette butts into when done. Make sure, of course, that the cigarette is completely doused. Once an angler has left the stream, he/she may dispose of that bag properly. The PF&BC has obtained a little pseudo "ashtray" that serve the purpose of a plastic bag. They will be made available to the local bait-shops in the near future. Takes all precautionary measures necessary to prevent the spread of exotic plants and animals, including live baitfish, into non-native habitats. Asian Carp and the like are a real threat to this region in the near future. Once again, this may not be an issue regarding the popular Steelhead streams, but on several occasions, in recent years, a few "interesting" sightings of non-native fish have been documented. Some folks might be tempted to dump a pet fish, or unload an unwanted exotic plant into the ecosystem. If that fish or plant is not designed to live in that environment, it could have a detrimental impact on the native species. Please be aware of this and report all unusual sightings! Learns and obeys angling and boating regulations, and treats other anglers, boaters, and property owners with courtesy and respect. According to Robert Sommer (1969) humans enjoy an area which is commonly called "personal space." Any unwanted intrusion within this area can put a person "on edge" (referred to as Personal Space Invasion Syndrome). For most social situations, a person can generally feel comfortable in a space/zone ranging from 6-8 feet. Depending upon the race, gender, and/or nationality of the individual, this comfort zone may be greater or less (see Hall 1966; Lawrence and Low, 1990). For some it may be as great as 10-25 feet! In any event, be considerate and give anglers their space to fish. Don't be afraid to ask another angler for permission to share a particular spot. There are numerous areas to fish! I do not know how many times I have passed by hoards of anglers fishing a hole to only find fish a few yards away that are "unmolested." Try not to contribute to the overcrowding problem by exploring a little more on your own. The rewards will indeed payoff. Besides, who wants to get a hook in the forehead or eye from an angler who is too close? "Herding fish" is another common sight on the streams. This practice entails one angler moving down steam to push fish upstream to their fishing companions. Two goals are achieved doing this. One, fish are moved so the other anglers can have a chance at them. Secondly, stirred fish often result in strikes for the anglers. This is both illegal and unethical. Interfering with the angling of others is a violation of the PA Fish and Boat Code, and could cost a person a substantial fine. Disturbing idle fish is unethical. While some may receive some enjoyment out of herding or throwing rocks in the water to stir things up, it may result in dire consequences. As was stated previously, move on to another spot to find more responsive fish. They are there! Early season Steelhead fishing is probably the most problematic time of the year for anglers. Anticipation runs high, the weather is good, and the fish are concentrated, fresh and feisty. Many anglers will flock to the lake to either drift by in boats, or cast spoons from shore. More often then not, boaters and shore anglers get into shouting matches over territory. Boaters think that the fish are close in, and the spoon anglers are trying to cast out as far as possible. Common sense should rule the day. Boaters should give ample space to the shore anglers, and shore anglers should not try to hit boats that may come too close. Respect each others space. For those streams that have boats launches, anchoring at the stream mouth can restrict the flow of boating traffic. Navigating the water is tough enough without having to veer around a boat. In sum, it is important to keep in mind that Steelhead are in the streams from September until May. There is ample opportunity to catch these fish! Ruining another angler's experience, in order to catch a fish right there and now, is not being respectful. Select a less crowded day, or move to another area. Nature is supposed to be enjoyed and, with a bit of forethought, it can be. Respects property rights, and never trespasses on private lands or waters. Keeps no more fish than needed for consumption, and never wastefully discards fish that are retained. If one is not sure of stream access, ask a property owner or check with the local bait-shops. The FishErie.com Website also has information regarding access areas. 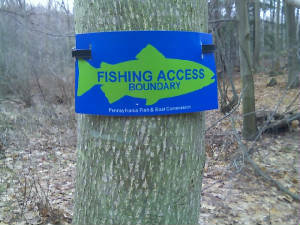 If a property owner does give access to an angler, one should get that permission in writing. This practice is advised for hunters as well. Additionally, just because the property owner gave permission one year, it does not mean that the permission extends a lifetime. Update your status yearly! If you ask permission, make sure that the permission is given by the rightful property owner. Too often, folks will give permission to fish a stream when they do not have the authority to do so. This really complicates matters and could lead to a landowner denying permission to anyone! Finally, when fishing an area, do not approach others and try to "run them off." The landowner may have given others permission as well. It really looks bad for the fishing community to have anglers improperly serving as "watchdogs." Perhaps one of the most disheartening sights one can see during the Steelhead season is a dead female Steelhead lying on the bank, the parking area, or in the woods which has been gutted for her eggs. This certainly is a waste of a resource, and should not be accepted as appropriate. While it is known that fresh skein is a very productive bait to use, one should not simply use a fish just as a means to collect bait. That certainly is unethical to do. If one prefers to use skein as bait, it is available at the local bait-shops. Of course it is perfectly acceptable to use the skein from a freshly caught female Steelhead, but leaving that fish behind gutted is not right. Apart from being improper, that particular action is deemed by the PA Fish and Boat Code as "illegal disposition" and could be a costly decision. While it has been documented that the majority of Steelhead anglers release their fish (see PF&BC Creel Study), a significant percentage of anglers will keep fish for consumption. Folks from all walks of life congregate to Erie streams to catch fish. If one chooses to keep a limit of fish each time they are out, they have a right to do so as long as the fish is used for consumption. Steelhead can be prepared in a variety of ways, and just because one does not have a "taste" for Steelhead that does not mean that all others have that same view. There are plenty of fish to be caught during the season. Those that choose to keep their daily limit are not harming the resource. Practices conservation by carefully handling and releasing all fish that are unwanted or prohibited by regulation, as well as other animals that may become hooked or entangled accidentally. Use tackle heavy enough to bring in the fish quickly. Given the number of break-offs that are reported by anglers and the number of flies, hooks, and "floats" swimming around, it appears as though anglers are using line that is too light for the fish. It is conceded that lighter line is needed for low and clear conditions. However, there is quality fishing line out there that can minimize the number of break-offs that one encounters even in these conditions. The other choice is to fish when conditions allow for heavier line. Use barbless hooks. For the purposes of releasing a fish easily without doing any harm, this is perhaps the most significant step an angler can take. Even accidentally foul-hooked fish can be released without harm using barbless hooks. Secondly one can avoid a trip to the emergency room if accidentally impaled. Keep fish in the water whenever possible. It is possible to release a fish while in the water. I have heard from a few anglers that a Steelhead never has to leave the water to be" properly caught and released" A proper net and forceps can do the job just nicely. Use knotless or rubber nets. Using these two types of nets minimizes harm to fish once netted. According to the experts on the subject, nylon nets are extremely damaging to fish and should be avoided if at all possible. I use two nets that I purchased from 2 reputable guides and they work great! It is worth the extra money spent to assure a healthy fish. Get your hands wet or use wet gloves or rags. Dry hands on a fish can be deadly. As many already know, Steelhead (aka 'slimers') have a protective coating on them that aids in repelling sickness and disease. Each time a fish is handled improperly, that fish loses this protection and increases its chances of dying. If the water is too cold to wet one's hands, one can purchase neoprene or rubber gloves that can be dipped into the water before handling a fish. Do not touch the gills or eyes. With the proper net and forceps, there really is no reason to touch a fish at all if one is to release that fish. However, if one is going to capture that moment on film or digitally, holding the fish by the tail and under the belly is proper (with wet hands of course!). Do not remove the protective slime. See above. Return to the water quickly. All the sources that I examined suggest that if a fish is to be out of water, it should be out less than 15 seconds! Another rule of thumb is to keep the fish out of water for not longer than half the amount of time you can hold your breath. Move exhausted fish slowly through water to force water through its gills. Too often anglers will kick or drop exhausted fish back into the water so that they will not lose "their" spot on the stream. From an observer's standpoint, this is really not a pleasant sight. Taking a few extra moments of time to revive a fish properly will greatly enhance its chances of survival. Nobody really enjoys looking at dead fish in the bottom of the pools! The following statement is perhaps the most controversial one of them all. However, after doing some research, and conducting numerous interviews with experts in this area, a simple conclusion can be made: If at all possible, do not break-off accidentally foul-hooked fish. Bring them in quickly and release them unharmed. Three harms are avoided by landing a foul-hooked fish quickly. One, taking out the hooks prevents disease and sickness in and on the fish. Secondly, if a fish has a multitude of hooks left on it, the chances are increased that the fish will accidentally get entangled on another line while swimming. Finally, removing foul hooks prevents the next lucky angler from injury. Besides, Steelhead that resemble Christmas trees are rather unsightly. *www.dnr.state.md.us/fisheries/catchrelease. Just one source that anglers can refer to regarding proper catch and release techniques. The above is just a starting point regarding the issue of angling ethics. Ethical standards are an evolving process dictated by time and place. As more individuals get out and discover the sport, there will be more issues that will need to be addressed to assure the future of Steelhead fishing. Ethical standards require time and thinking that goes beyond the self. They require time because one should think about actions before situations are confronted, and they require thinking about the bigger picture as opposed to looking through the eyeglass in reverse. I would like to thank those that had a hand in drafting this article namely, Ken Nulph, Kelli Geyer, Doug Kramer, WCO Mark T. Kerr, and my infamous "brother" who I hope learned something from this. Also, I would like to acknowledge those that I have the pleasure to fish with and learn from in recent years. Those folks include: Don Mathews, Glenn Mills, Mike Hines, John McCullough, Richard Criley, Blaine Buterbaugh, Adam Wagner, Terry Yocum and Al Budinsky. You all have impacted me in some significant way. Finally I would like to extend my love and appreciation to my father who showed me the way. Slainte´ Mhäth! Bowen, Jon. (1999). "Personal Space Invaders." www.salon.com/hjealth/feature/1999/09/01/personal_space/print/html. Retrieved 1/3/2005. Hall, Dr. Edward T. (1966). The Hidden Dimension. Garden City, NY: Doubleday. Lawrence, D. and S. Low. (1990). "The Built Environment and Spatial Form." Annual Review of Anthropology 19: 453-505. NMFS Adopts Code of Angling Ethics. (1999). http://www.enn.com/news/enn-stories/1999/03/033199/codeofethics. Retrieved 9/8/03. Pennsylvania Fish and Boat Code. Act 1980-175 Title 30 Pennsylvania Consolidated Statutes. Sommer, Robert. (1969). Personal Space: The Behavioral Basis of Design. NJ: Prentice-Hall. "You Can Make a Difference: Catch and Release." www.dnr.state.md.us/fisheries/catchrelease.html. Retrieved 10/5/2004.